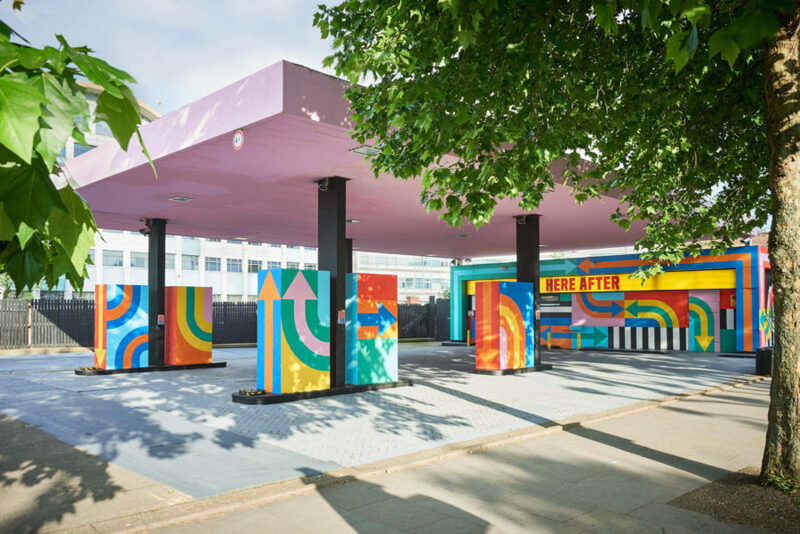 Designers Craig & Karl have playfully revived a derelict petrol station on Wood Lane in London’s White City to create HERE AFTER, a public and visually arresting art installation that riffs on the area’s importance to British broadcasting history. Adapting the bright hues of a television test card, the colourful design nods to the petrol station’s location directly between Television Centre and White City Place, the former BBC Media Village. HERE AFTER gives the site a new life by twisting the appearance of commonplace petrol stations and patching together the mishmash of striped forms and colours found in major fuel companies’ branding. In an almost chaotic fashion, the site reinvents itself from the fragments of its past. Vibrant, striped sections of painted colour wind and bend around the petrol station site, leading passers-by and visitors to discover the space’s ‘hereafter’, suggesting a place to meet or something yet to come. HERE AFTER is the international design duo’s first major public artwork in London. The project is the first stage in a regenerative scheme for the petrol station, which will soon have a new life as a venue for pop-up events, while White City is undergoing an £8 billion decade-long regeneration that will see the formation of a thriving creative neighbourhood. Image copyright Jamie McGregor Smith 2017.